Episode Theme: Never judge a book by its cover. 1. Have you heard the phrase “Never judge a book by its cover”? 1 Samuel 16:7 says that we do just that: we judge people based on what they look like on the outside. Have you ever judged someone by what they look like? 2. In Luke 10:25-37 Jesus told a story about a man who was travelling from Jerusalem to Jericho. He was attacked, robbed and left for dead. The first two people to come by were a priest and a scribe. These were religious leaders. People listening to Jesus’ story thought they would help out the hurting man, for sure! But the audience could not believe it when Jesus told them that the religious leaders both walked by on the other side. Then Jesus said that a Samaritan had come on the scene. During Jesus' time, Jews and Samaritans did not like each other. Jesus told the audience that the Samaritan rescued the hurting man. He brought the man to safety and paid for his care. The audience were totally surprised by this story's ending. As you listen to today’s episode, think of a time when you thought knew something, but then were surprised to find you were wrong. 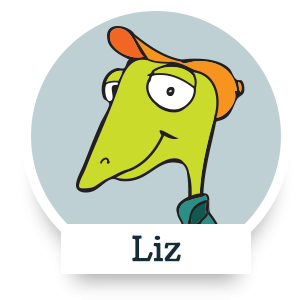 In this episode Liz judges people based on appearances (and names), but discovers that that leads to mistakes. Today, it’s common to hear the phrase “good Samaritan”. But when Jesus told the story of the Good Samaritan (Luke 10:25-37), his audience had different ideas in their minds of what people were good and what people were bad. Imagine their shock when they saw that the Samaritan was good because of his care and actions. Most people do not feel comfortable admitting that they judge people. Sometimes they base those judgments on what they have heard about other people. Sometimes they base judgments on their own fears. But if Jesus really lives in your heart, there is no room for that kind of judging. Every person is created in the image of God and deserves to be seen through God’s eyes. Want to dig deeper and learn more about seeing people through God’s eyes? Check out Acts 10:34-35, Galatians 3:28, and 2 Corinthians 4:18. What is the name of Liz's regular dentist? 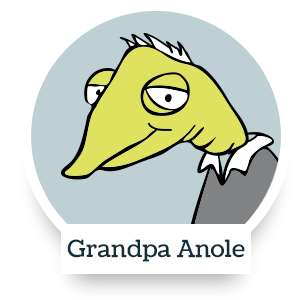 Why is Grandpa Anole in pain? He had a root canal. When Liz's dad "drives the lane", what happens to Liz? Liz’s Dad and Liz collide into each other and Liz starts bleeding from the mouth. Describe how Liz imagined what Doctor Pain looked like. Having a spiky long tail and a snaggletooth. Take some photographs of different people. Take a picture of them just sitting normally. Then take an action shot showing who they really are inside. Have them show off their passion in the picture. For example, take a photograph of your grandmother who loves to dance or your best friend who loves animals. 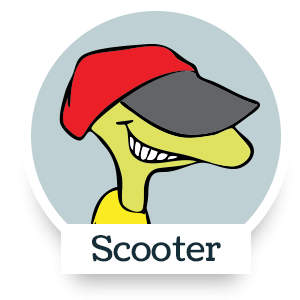 What would you have thought about this person based on their first picture? How does this help you see these “books” beyond their “covers”?